Baghdadi wounded in airstrike? ISIS leader reportedly hurt. 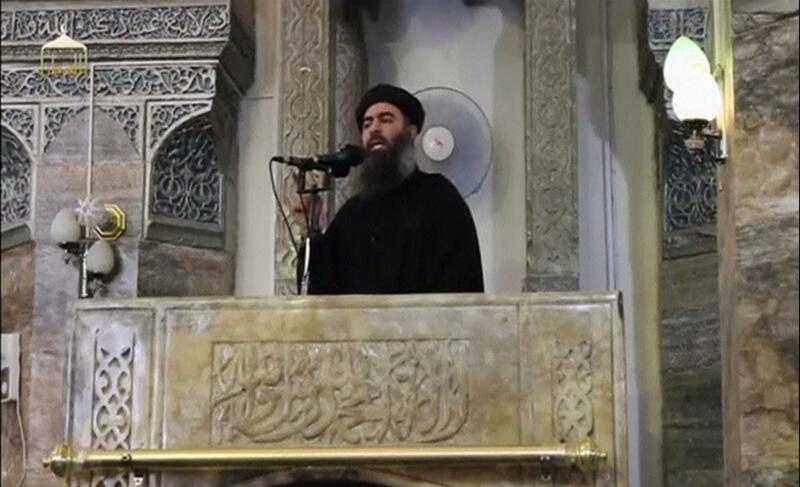 From a video of a man believed to be Baghdadi at a mosque in Mosul, Iraq, in 2014. ISIS leader and self-declared Islamic caliph Abu Bakr al-Baghdadi “suffered serious injuries” during March coalition bombing in Iraq and is not currently in “day-to-day control” of his organization while he recovers, the Guardian reports. The paper says that the jihadi’s condition was initially so grave that other group officials met to make plans to name a successor. Two separate officials – a western diplomat and an Iraqi adviser – separately confirmed the strike took place on 18 March in the al-Baaj a district of Nineveh, close to the Syrian border. There had been two previous reports in November and December of Baghdadi being wounded, though neither was accurate. The diplomat confirmed an air strike on a three-car convoy had taken place on that date between the village of Umm al-Rous and al-Qaraan. The attack targeted local Isis leaders and is believed to have killed three men. Officials did not know at the time that Baghdadi was in one of the cars.